The Japanese giant looper, Ascotis selenaria cretacea, is a serious defoliator of tea gardens in Japan. GC-MS analysis of the virgin female extract confirmed the presence of (Z,Z)-6,9-cis-3,4-epoxynonadecadiene. This compound had attracted male moths in a previous random screening test using C17–C23 epoxydienes synthesized in a racemic form. Further GC and HPLC analyses with chiral columns showed that the natural pheromone was composed of 3S,4R and 3R,4S isomers in a ratio of 53:47, although the field evaluation revealed stronger activity of the pure 3R,4S epoxide than of other enantiomeric mixtures. This result indicates that the sexual communication system of this Japanese subspecies differs from that of the species in Israel, which is selectively attracted to an isomer with the opposite configuration. Interestingly, the 3S,4R epoxide attracted another geometric male, Alcis angulifera, in our field tests. 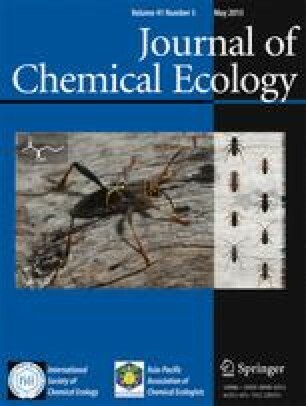 (Z,Z,Z)-3,6-9-Nonadecatriene, a parent olefinic compound of the epoxy pheromone, was also identified in the gland extract of A. s. cretacea, but its effect on the attractive activity of the epoxide was not assured in field tests. The amount of the triene increased in the virgin female during photophase and also after decapitation. The epoxy component completely disappeared after decapitation, but could be increased by an injection of subesophageal ganglion extract. The data suggest that the triene is a biosynthetic precursor of the epoxide and that a neuropeptide hormone (PBAN) regulates the epoxydation.